Ipek villa is newly built and has well planned accommodation to include terraces to each level.There are three large bedrooms, three bathrooms, lounge with kitchen and dining areas, doors and windows letting in light and air, making the feel of the house very spacious. Villa Nesrin is newly built and has been designed for comfort and ease, with three large bedrooms, three bathrooms, open lounge with kitchen and dining areas, a terrace to each level from which to enjoy those wide ranging views, an infinity swimming pool set so you can see the sea whilst sunbathing or swimming. 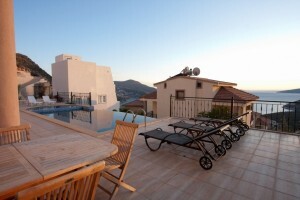 This brand new villa is a luxurious private property providing superior living accommodation, coupled with stunning and uninterrupted sea views over Kalkan bay and easy access to the village and all of its attractions, as well as the weekly market and local transport facilities. This newly built four bedroom villa is an ideal base for your holiday.The kitchen is well designed and offers not only a washing machine, but, a dishwasher too, ample work surfaces and plenty of cupboard space. The lounge is spacious, well laid out and if you can drag yourself in from the terraces and pool, a perfect room to relax in. 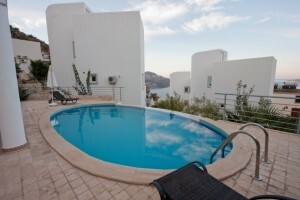 One of the four villas is a show villa ready and available to view. 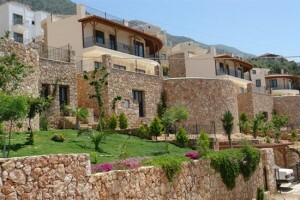 The remaining three villas will be completed internally according to the buyers’ choices. 4 luxurious villa with private pier sitting on a stunning bay in Kalkan … Set in one of the most fabulous beach resorts on the Mediterranean coast in Kalkan … Each has three, four or five bedrooms, no less than four bathrooms, an open plan kitchen and lounge, and a private pool.